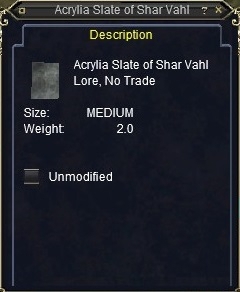 I have lost my acrylia slate, how do I get a new one? This question comes up now and then. Registar Bindarah tells you if you lose your slate to return to her and ask for a new one. But, when you ask, you are met with a blank stare. There is a trick to it that I just discovered. Mignah *is not* the one you want to go to for a new one. Mignah gives you an *acrylia slate*. When you turn in your document and acrylia slate to Registar Bindarah, she eats your *acrylia slate* when she hands you the letter to the king. When you turn in the letter to the king, and then return to her, she gives you the application and an *Acrylia Slate of Shar Vahl*. Lore, No-Drop. If you lose your slate, you do return to her and say "I need an acrylia slate of shar vahl"
Questos Ravenbrew, Servant of Pravus Mortis. -Master Alchemist with Mundunugu Medicine Stick. What is the next quest for a bestlord? For some reason my Slate dissapeared after I handed it in with my stamped note, she did not give it back. There any way we can re start this dumb quest?